What is Authentic Japanese Okonomiyaki? This strange-sounding Japanese name food has become one of my personal favorites throughout the world. When in Japan it can be part of a dining experience unlike any other. In restaurants where you make your own, they usually give you the option to make Okonomikyaki or Takoyaki. Both are pleasing to make, but what are they really? Okonomikyaki is a pancake like entre that you usually make at a table griddle for you and your friends. Once you have completed cooking this meal, you then cut it into individual servings for each of your members at the table. “Okonomi” is a term that means “what you like.” The term is a loose one but allows the consumers the option to place whatever they would like inside the pancake-like flour mix. Some popular favorites include shrimp, octopus, and Mochi, a style of gummy cheese that is a very popular favorite for both the local Japanese and its foreign guests. “Yaki” means grilled. This explains the griddle in the middle of the table in which all the guests will cook their own meals. This is similar to the experience you would get at a Shabu-Shabu restaurant, or Korean barbecue. By grilling your own food you get to enjoy the company of others while getting ready to chow down on your meal, creating a fun experience for all. Takoyaki usually goes hand in hand with Okonomiyki and is served at the same restaurants. It is a Japanese term which loosely means octopus balls. These are made on little skillets that look like iron egg crates. The person doing the cooking will pour the batter into the slots and be responsible to keep turning them until the form little pancake balls. Since each person has their own tastes, there are many variations that can be made to the flour mix. For the most part they will all include eggs, flour, salt, cabbage and pickled ginger. To top off this delicious meal you would add a Tonkatsu Sauce. 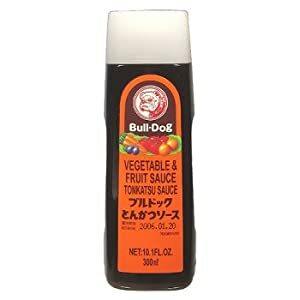 My personal favorite is Bull-Dog. It is sweet and has a delicious flavor of a syrupy barbecue sauce. The Japanese are very big on their fish and mayonnaise so you may do it the traditional style by creating a nice cross pattern of mayonnaise and sprinkle the top with dried fish skins and seaweed. Since I am not a seafood lover, I opt for ending mine with a heap of Tonkatsu Sauce and a nice glass of saké. In my searchings I have found a kit to make Okonomiyaki which make three separate pancakes. It is also not that difficult to find as they sell it at the Amazon Marketplace. Good luck in seeking out some authentic Japanese Cuisine, and let me know how you like your Okonomiyaki! I love Okonomiyaki! I make a criss-crossed bacon one with kewpie mayo. Add a beer and you can't go wrong! Glad you pointed the way to the ingredients. Never heard of Okonomiyaki before. I love okonomi yaki. It's funny that in Japanese restaurants here in Thailand they call it "pizza yippon". Delicious.